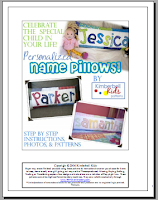 Thank you very much to everyone who entered the YCMT Personalised Name Pillow Pattern giveaway. With the help of my lovely assistant random.org, two winners have been selected. Congratulations to Lisa and adri_pc. Your pattern is on its way! Thank you also to YouCanMakeThis.com who generously provided two copies of their lovely pattern. If you would like to buy your own copy of the pattern, head over to YCMT. There are loads of other sewing, crochet, cooking, scrapbooking and other craft patterns/instructions to choose from too. YAY. Thank you SOOOO much. Great site! Keep it up the good work and also keep posting.